For starters I wanted a smaller board so I could fit it inside an enclosure. 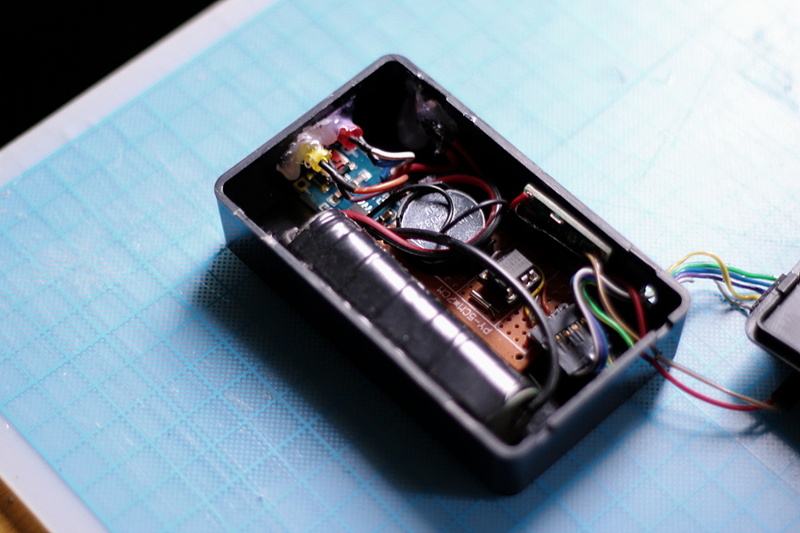 I also wanted to power the clock from a rechargeable 18650 battery and add the charging circuitry to the design. I was also willing to give up with the ultra low power consumption and use a DC-DC booster that would of course draw more current but would ensure the clock gets a nice and stable 5V at all times. This has two advantages: It keeps a constant brightness for the display, and, more importantly, will give me reliable 5V in the aux port so I can easily interface the clock with other devices or external circuitry if I so desire. Smaller board. Connectors all sit at one side, and the control buttons are nicely placed next to the display. To reduce the size I used 0603 parts for the pull-ups resistors. The only “big” resistor in the board was kept thru-hole to make the routing easier. For charging and voltage-boosting I’m using external cheap modules I got from ebay, and they work great together. 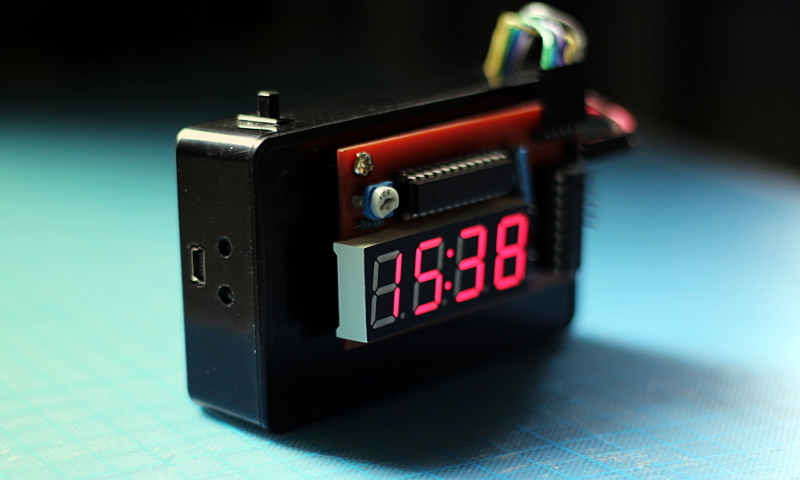 Since the clock still draws very little current, even with the booster attached, the charging module can charge the battery and power the circuit at the same time, so if the batteries run out of charge I can connect the clock to a USB port and it will not only start charging the batteries but will also resume operation immediately. As you probably saw already, I revised the board layout and schematic to make it more compact, and while the new board can fit tightly inside the enclosure with a 18650 cell, I miscalculated the depth of the inside of the box I was using, so I couldn’t really fit everything with enough room to put the cover back on. Because of this I ended up stuffing all the external modules inside the enclosure and mounted the clock PCB outside. Also since I had the components I made a replica of the DS1302 RTC module on a perf-board, because a spare time-keeping module is always a nice thing to have. The guts. 18650 battery, charging module (with status leds), power switch, DC-DC 5V booster, and a perf-board version of the DS1302 time-keeping module. Everything secured in place with hot glue and double sided mounting tape. Not a perfect solution but ended up being a pretty “hackeable” configuration: Every relevant connector is right there, so I get full immediate access to the aux port, the +5V out, and the time-keeping module. I can easily connect and disconnect them, or temporarily use them with other devices. Yes, it still shows temperature. This was a very small update overall. No features were added but I’m very happy with the way it works now. I definitely need to re-charge the internal battery more often than before, but this is a mostly painless process. I only need to connect the clock to a nearby USB port and it can work while it charges. Also, I’m no longer constantly swapping AA batteries, and the brightness of the display no longer depends on the battery voltage. All the changes have been pushed to the Git-Hub repository. Next thing I have in mind is adding an alarm mode, which shouldn’t be hard to do, but since I don’t really need it only time will tell if It gets implemented (pun most-definitely intended). 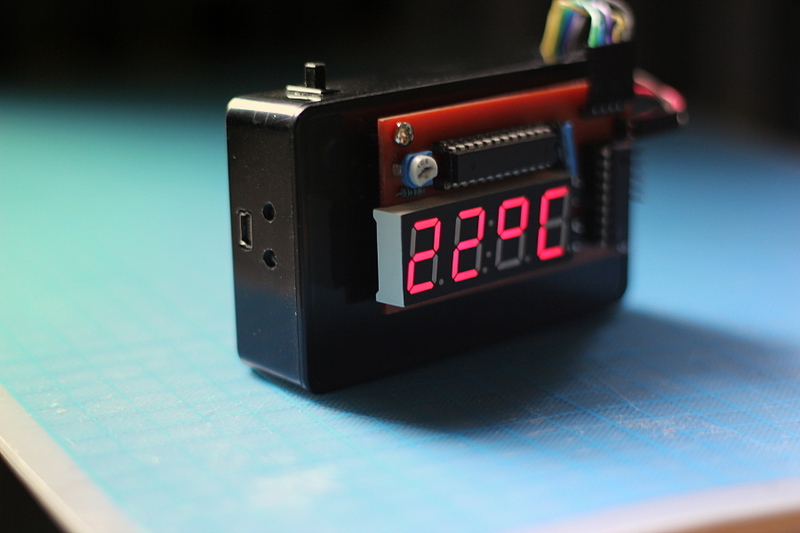 This entry was posted in Arduino, Electronics, Lab and tagged 16f628, 18650, clock, ds1302. Bookmark the permalink.